If you were to judge The Creeping Flesh purely by its lurid title and poster, you could be forgiven for assuming it was a standard creature feature. Indeed, it does feature a creature, in inhuman skeletal form that’s flesh grows back on (or creeps) when it gets wet, but this is no mere monster movie. Instead, it’s a study on insanity, obsession and family, coming in more like a Shakespearean tragedy than a horror film for the most part. 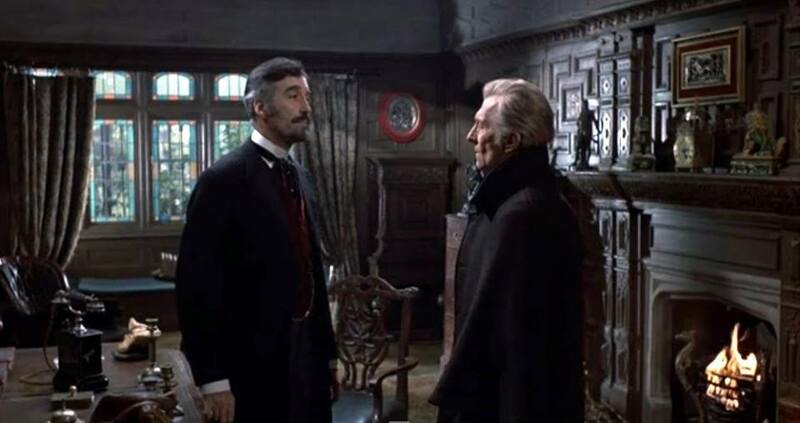 It also features one of Peter Cushing’s finest ever performances, a wonderfully icy Christopher Lee and a young lead actress in Lorna Heilborn who not only holds her own up against the two legends, but frequently steals the show. 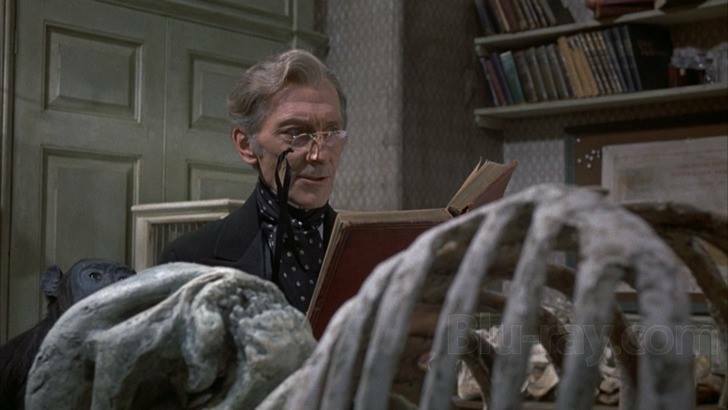 Professor Emmanuel Hildern (Peter Cushing) has returned from New Guinea with a skeleton of what he believes to the be the physical embodiment of evil. He’s a troubled and broken man after having to confine his insane wife to an asylum overseen by his cold, emotionless brother Dr. James Hildern (Christopher Lee), under whose care she eventually died. Hildern now believes that insanity may be a hereditary trait though, so has lied about his wife’s mental illness and subsequent death to his now adult daughter Penelope (Lorna Heilborn). 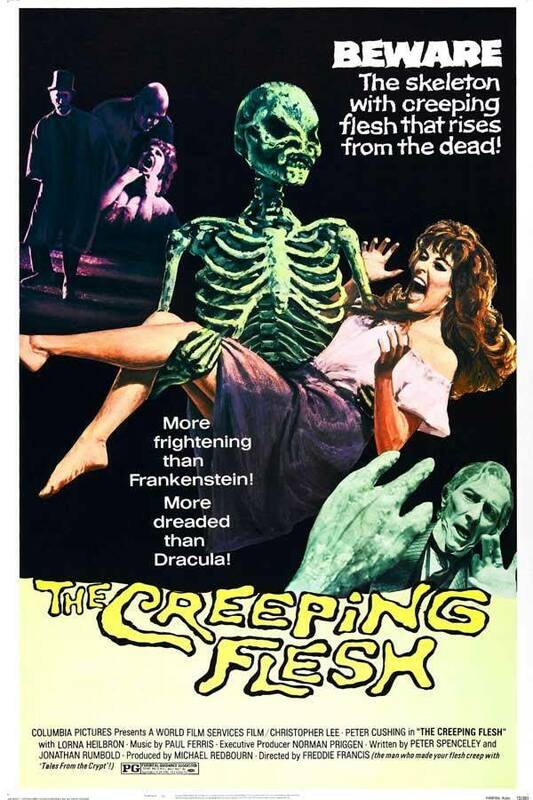 What a different kind of film The Creeping Flesh is. It’s most definitely a horror, but it’s much more of the psychological kind than it first appears to be. It’s got a lot to say about the root of evil, human nature and fate itself. Big ideas and philosophical concepts abound, draped around what looks like a standard Hammer-inspired Victorian horror story. It’s not the ideas that really make The Creeping Death though, it’s the cast. 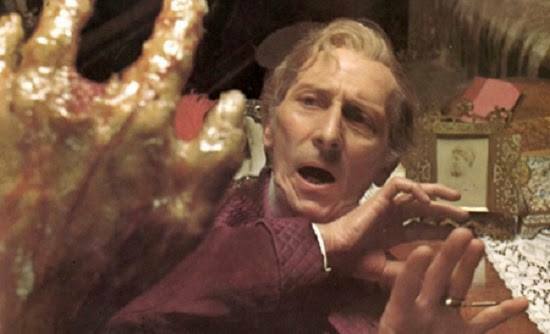 Peter Cushing is an actor who rarely isn’t anything other than enthralling to watch, but he gives one of his finest-ever performances here as the conflicted scientist Hildern. Initially he appears as one of those regular eccentric professors so common in lesser efforts, one whose obsession over their life’s work comes at the expense of everything else, even their family. That’s not the case here though, as it soon becomes apparent that Hildern cares so deeply for both his daughter that he’s devoting his life to trying to find a cure for the madness he’s convinced will befall her. It’s insane in its own way of course, but Cushing is such a rare talent that he utterly convinces in the role, imbuing Hildern with such pathos and humanity that it’s impossible not to empathise with him. It’s a wonderful reading by the great man and he’s as good here as he ever was. The scene alone where he realises his wife hasn’t come back to life, it’s just his daughter in her (forbidden) room wearing her clothes is a rollercoaster of emotion, from delirious hope, to anger, to heartbreaking pain. It’s one small scene, but man, it’s a chance to see a master at work. There’s no such warmth or empathy from Christopher Lee though, who gets to play one of the coldest roles of his career. His Dr. James Hildern isn’t quite a monster, but he’s not far off it by sheer dint of his complete lack of human decency, making him the absolute last person who should be dealing with the mentally ill. Lee is perfectly cast here obviously, bringing all the aloofness and gravitas that serve him so well in smaller doses right to the fore for a character who thinks nothing of shooting an escaping inmate in the back. It’s Lorna Heilborn who’s the biggest surprise here though. Lee and Cushing are the safest pair of hands in horror, but she is every bit as important to the effectiveness of The Creeping Flesh as either legend. Her downward spiral into the madness that consumed her mother is brilliantly charted and is totally convincing. It’s gut-wrenching at times, but in lesser hands the whole film would never work as well as it does. As for the actual creeping flesh and the creature it creeps back onto, there’s not a huge amount of focus on it, but what there is, is suitably atmospheric. It’s a weird, inhuman looking thing and does what it needs to do. Again though, this is a psychological, philosophical horror not a creature feature and a taunt script and an excellent cast ensure that it’s a bloody effective one.